CasinoBonusNews → Casino Games → Slots → "Battlestar Galactica"
This innovative new 243 Way Video Slot will blow you away with its fast paced action and spectacular special effects. Battlestar Galactica features a well-known cast of characters of the critically acclaimed TV series. 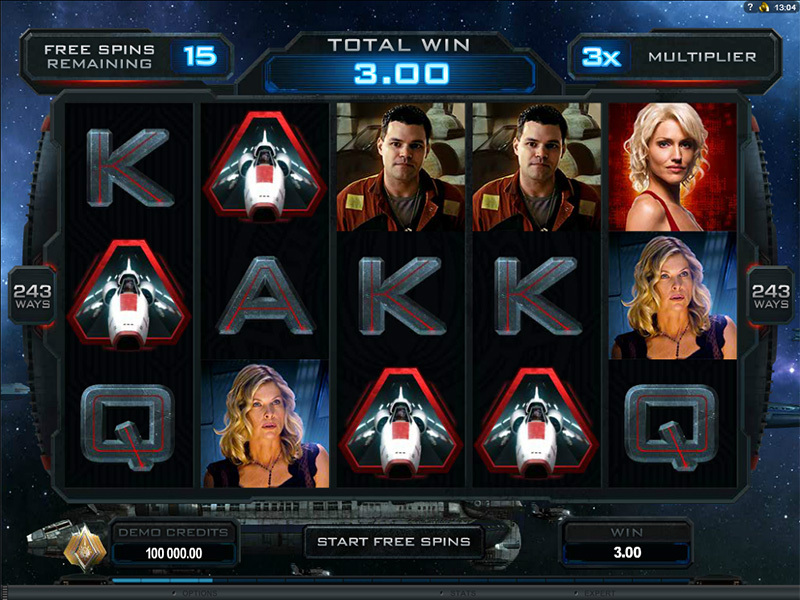 This exciting space adventure slot boasts multiple game modes, each containing unique bonus features and special functionality. The Wild symbol in the normal mode is stacked on reel one in the normal base game and Free Spins features. The Normal Base game includes the Ion Storm Wild reel feature and triggers 15 Free Spins with 3 or more scatter. All of these Free Spins wins are multiplied by 3x. During the RUN Mode wins pay for left to right and right to left winning combinations. This mode introduces an exciting and Innovative new feature. When a special FTL symbol lands anywhere on the middle reel, it will cause all the Royal Symbols to jump of screen and will then be transformed into a mystery symbol to award additional wins. In the FIGHT mode, random symbols can be turned wild at any time as the Cylons and Colonials battle it out over the reels. In addition the Wild symbols can split into a double wild. 3 or more Scatter symbols will award 5 Free spins with the ability to achieve additional Free Spins. A feature that is sure to keep players spinning is the Ranking Achievements. 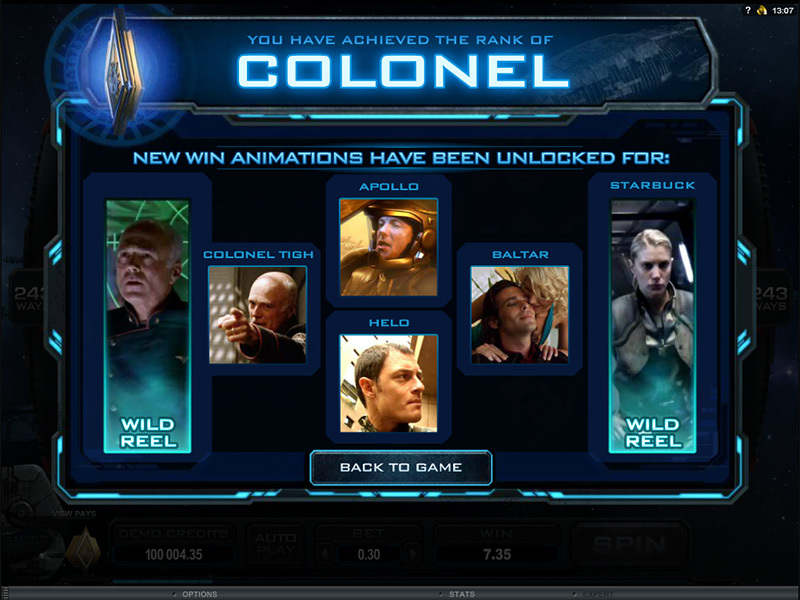 Progress in Rank will promote you from Civilian up to the 8th rank of Admiral, unlocking more and more of the Battlestar Galactica series’ video content. Giving you the overall ultimate experience and allowing you to enjoy hours of your favorite scenes and sounds. 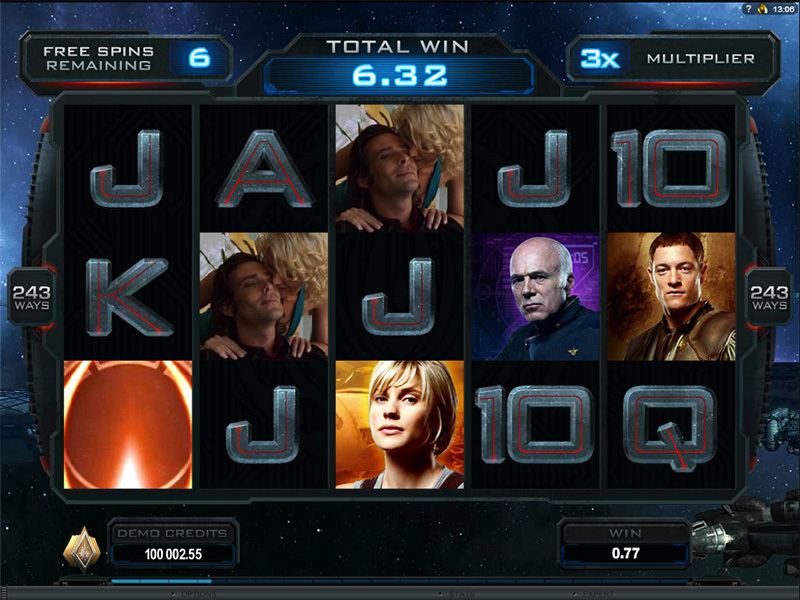 For a Sci-Fi action filled dramatic gaming experience – Don’t miss the Battlestar Galactica Video Slot!